“A hut what?” My mother asked when I told her we were going on a hut trip. Mind you it’s February and she wondered why I would want to take my kids camping in the middle of the winter. Well, we were going camping, but this is a nice cozy cabin in the middle of heaven with a 360 degree view of mountains, trees and simple open beauty. It is an unforgettable experience that will remain fresh in your family’s memory forever. 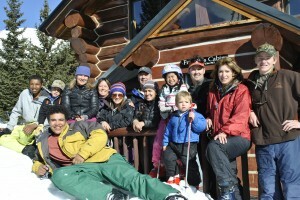 As with most experiences in Colorado, there is a hut trip for everyone’s skill level and degree of fitness. From the Nordic Yurts in the Never Summer Range which offer easy access, to the advanced, multi –day and multi-hut 10th Mountain Division Hut system loops. The www.huts.org web site has detailed information regarding each different hut system as well as the reservation system, help you plan a trip, find a guide if you want one, and even offer educational programs such as wilderness first aid etc. While navigating the huts.org website, consider selecting the right trip based on location, distance from the trailhead, amenities such as; indoor composting toilets, wheelchair-accessibility, and even ovens. You then choose which days and how many spaces you need. For instance if Janet’s Cabin (part of the 10th Mt. Hut System) capacity is 20 beds and there are 12 spaces available- you can call the phone number on the website to book the remaining spaces for your group. Note they do not take online reservations. If you have a specific date that is very popular and want to book the entire hut for your group, you most likely will have to sign up for the membership and lottery system a year in advance. For my first hut trip with children of all ages, I convinced three other families, and decided to book the entire hut for a specific date. We were happy with a Tuesday and Wednesday night and luckily found a spot. I also recommend staying two nights, as it affords you plenty of time to you enjoy your efforts. With children ages 3 to 17 we decided on Francie’s Cabin of the Summit Huts Association, located just outside of Breckenridge. It has a capacity of 20 people, indoor compostable toilets and offers an easy 1.1 mile trek. Did I also mention it has a sauna? Hut Trip Luxury! Having a “Hut Trip Head-Honcho” is important for a number of reasons: Having someone with route finding knowledge, first aid skills, availability to book the hut, download the necessary waivers and parking passes, knowing the lock codes, and making sure everyone is geared properly are all important. Remember you are venturing into the Colorado Backcountry in the middle of winter. Avalanche danger and hypothermia are very real possibilities and proper preparation is essential. Since organization and planning are the key to anyone conscious of the amount of weight they are going to carry on their back, it is important to coordinate with all members of the group. Or not… For instance, I thought we had coordinated which family was going to be bringing breakfast, dinner, etc. However, when I got to the hut and saw my friend unload TWO entire GALLONS of milk, I was shocked to think that we didn’t communicate properly. I then came to realize that it was not miscommunication, but a concerned mother who thought she should throw in a couple gallons of milk for anyone that might need it. I was glad I wasn’t her husband who had to carry it in. Generally people cross country ski or snowshoe in. Randonnée equipment and telemark skis with skins make skiing from the hut enjoyable. There are several shops that rent equipment for backcountry skiing including avalanche beacons, backpacks and even pack sleds. Sleds are ideal with small children when they can’t ski all the way by themselves, as well as that extra gallon of milk… or two! Often times you can find equipment from friends and neighbors. The most important thing about venturing out on a hut trip with kids is to remember to make it fun. Take your time getting there. Stop for picnics and games to break up the trudge if you can. It’s not the destination with children — it’s all about the journey. Nothing can ruin a trip more than a cold, whiny, hungry child. Once you’re at the hut, make yourself at home. Every hut has a wood burning stove and electricity, usually powered by a photovoltaic system. Clear directions to the stoves, ovens, saunas, electricity, rules, etc are displayed in every hut. I cannot stress enough the importance of respect to the huts and its surroundings. Also note; most dogs are not allowed at the huts since you are using the pristine mountain snow for your water source. Everyone has a favorite part of the hut trip; my husband, likes to get up early with his buddy and get the fresh tele tracks down the mountain. My friend Mary likes to climb to the top with her daughter and enjoy the view together. The kids love making jumps and snow forts, treasure hunts and the passionate charades game. I am always moved by the effect going into the backcountry has on the kids, who are so technologically distracted. Kids especially feel a part of the experience by getting involved in the daily operations of the hut. There is wood to be chopped, snow to be gathered, snow to be melted, snow to be shoveled, water to be boiled, dinner to be made, there is always something to be done. Not only that, you might find new wonders in watching your child get creative with charades and their made-up games. When was the last time you spent two nights with your good friends hold up in a cabin in the middle of the wilderness, with no one around, no cell phones, and no distractions or plans? These are the times where friends are bonded for life, songs are sung, games are played, and memories are made. Don’t let your time slip by with your family without having experienced a hut trip. You will never regret it. Though, you can leave that extra gallon of milk at home.